For five years straight, we were beyond excited to see the Giant Swallowtail Butterfly (Papilio cresphontes) gracing our northern garden. Last season was the first time in years we saw zero giant swallowtail butterflies…had extending northern hospitality to a southern butterfly species been a waste of time? 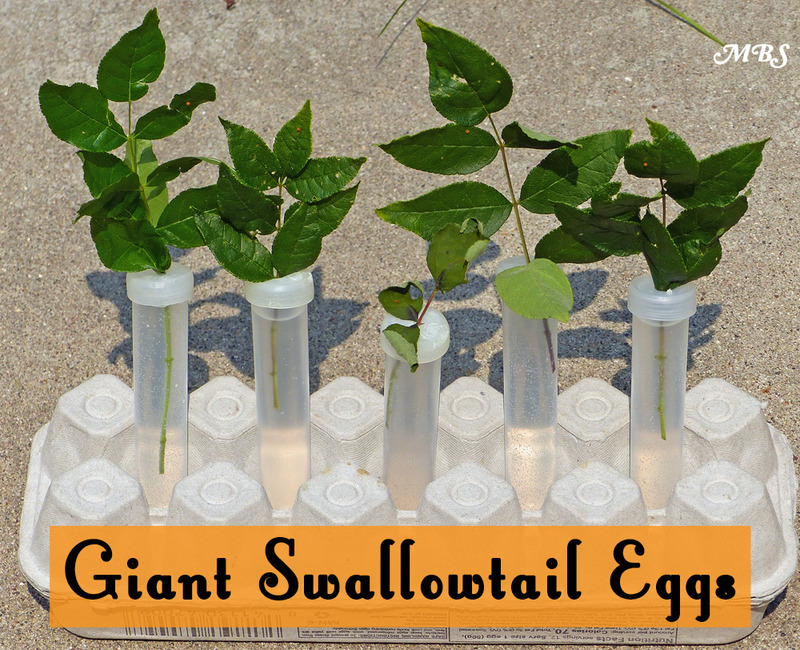 Unlike milkweed-obsessed monarchs, the giant swallowtail female will lay eggs on a wide range of host plants. Their butterfly life cycle also takes up to 2 months, so the odds are stacked against northern gardeners wanting to raise them with fewer generations and more plants to search! We didn’t have enough space to add full-grown citrus trees, so we stuck with some smaller host options. We planted a waferash tree, a slow-grower that tops out at 20 feet. We also planted common rue, and a northern prickly ash. 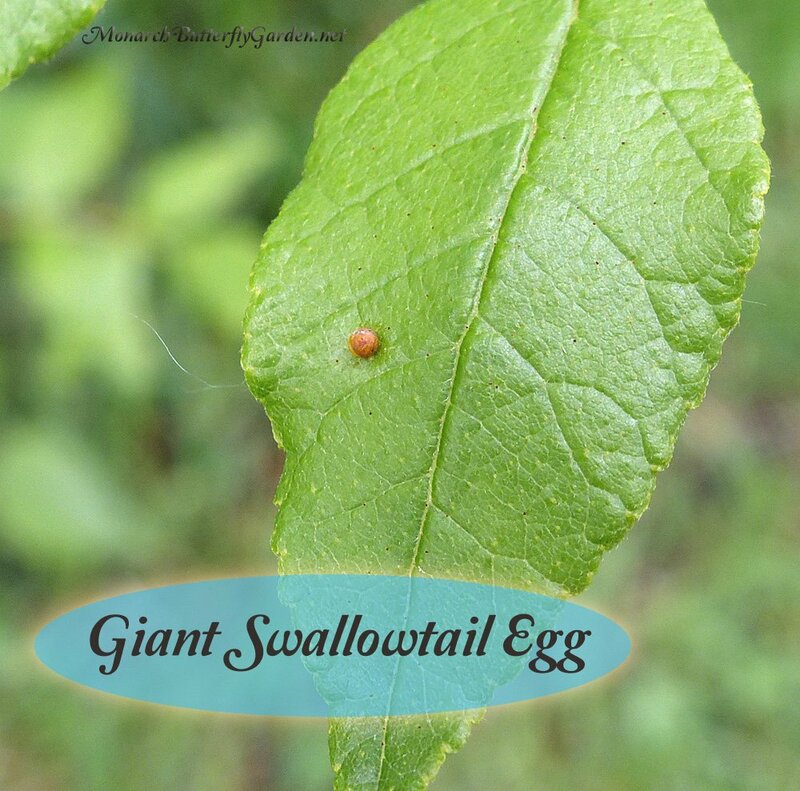 The eggs of the giant swallowtail are pretty easy to find compared to other butterfly species that resort to trickery and camouflage to keep their eggs safe. 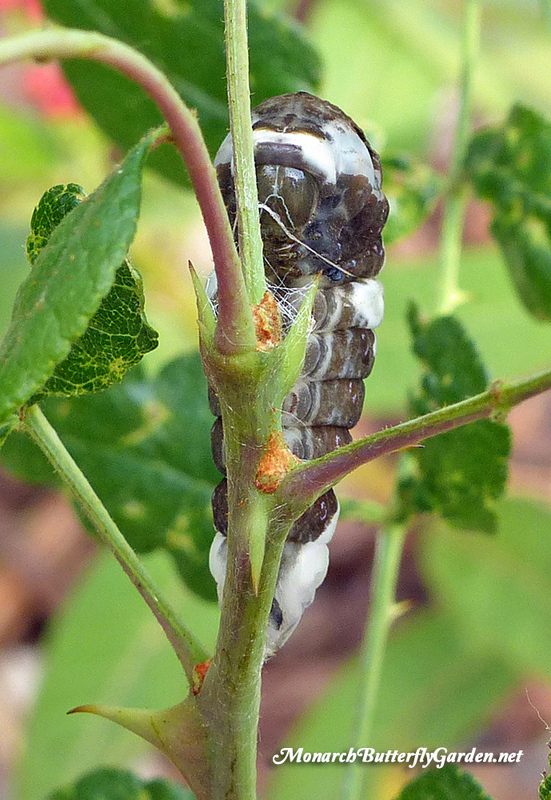 The giant swallowtail female deposits orange-peel colored eggs on the surface of green leaves, which means you shouldn’t need to get out the old magnifying glass to confirm identity. Brenda of Brenda’s Butterfly Habitat shared that Zanthoxylum americanum (northern prickly ash) was the giants’ host plant of choice in her Michigan garden. As easy as the eggs are to locate, they can still be easy to miss because our prickly ash sometimes gets an orange fungus, so perhaps the eggs are better camouflaged than it would appear! A third line of defense is the red horns (osmeterium) that emerge from the head of the caterpillar when it feels threatened. The osmeterium emits a pungent odor, that is supposed to make them unpalatable to predators, like ants. I stroked one across its back, and picked up another that was looking for a fresh cutting…neither action was enough for them to ‘Release The Red Cracken’. Did you notice the dangerous thorn next to the back of the caterpillar photos above? I was going to offer the caterpillars our rue plants without the thorny barriers, but decided to try serving this because I need to cut it back to avoid getting gouged when mowing the back yard. Put the cuttings inside the caterpillar cage. 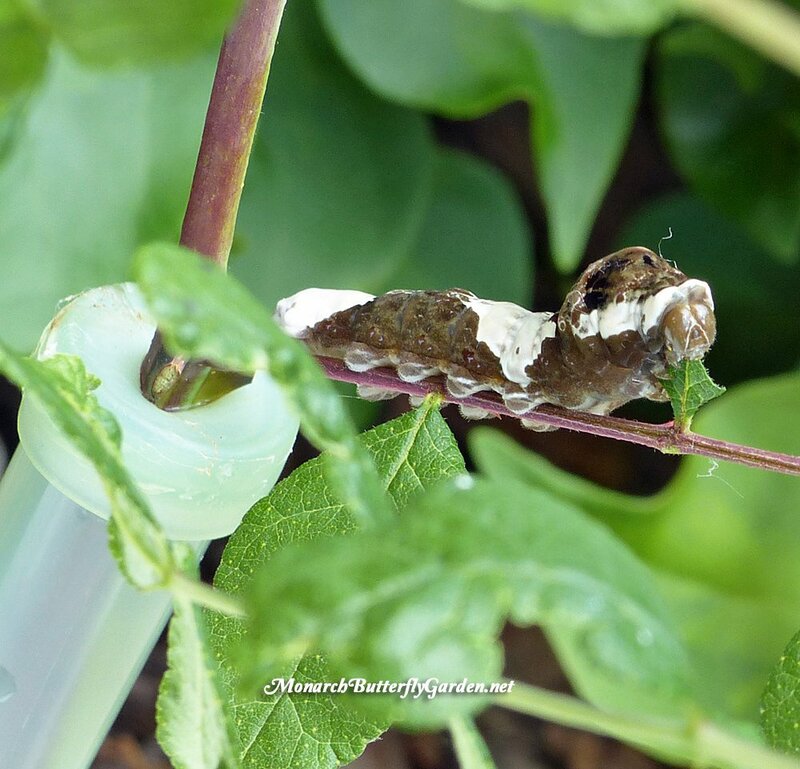 If you’re replacing cuttings, set the new cutting container next to the old one so the caterpillars can crawl over to their new home and caterpillar food source. Mess with my Chrysalis…Get the Thorns! However, if a caterpillar forms its chrysalis in an inconvenient place it can be moved. 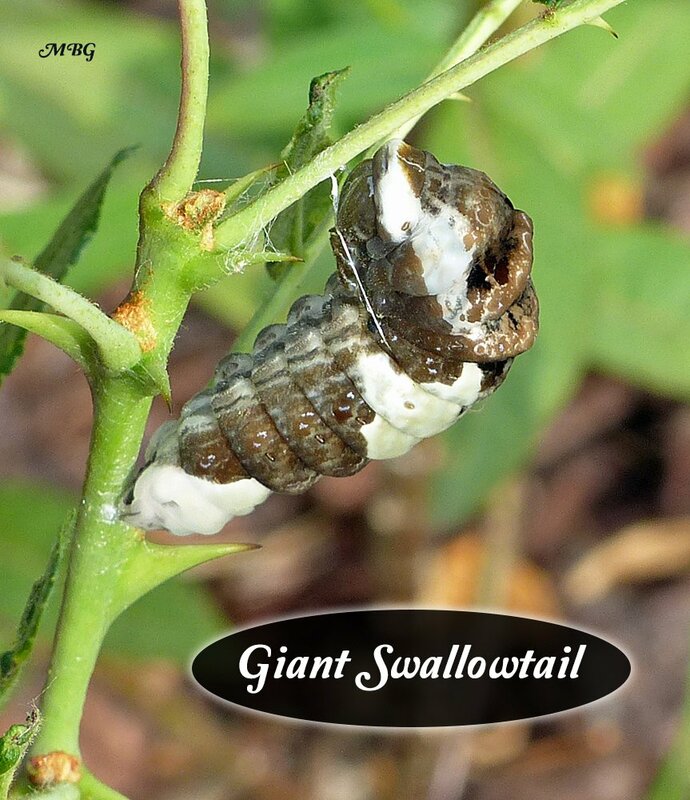 Check out the info on removing swallowtail chrysalides in our overwintering swallowtails post. Swallowtails males are said to have thicker, more vibrant yellow wing markings, but there seems to be a lot of variation that makes sexing them from a dorsal view difficult, at best. 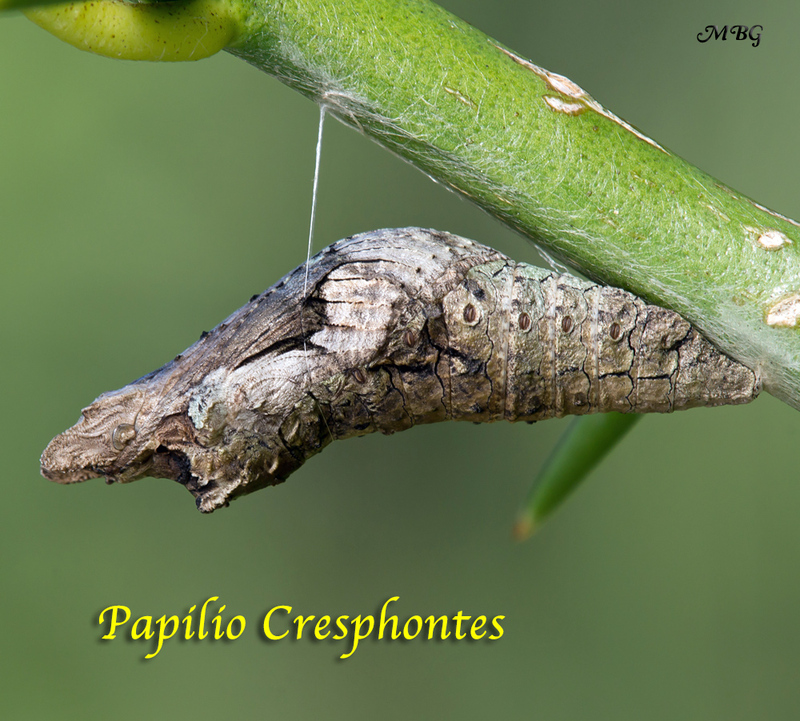 For a positive male ID, see if you can find claspers on butterflies you are raising. Please Read the Comments Section below for more info about raising giant swallowtail butterflies. I have 3 Giant caterpillars on a small toothache tree (prickly ash) that I intentionally purchased with them on it a couple of weeks ago. I also have a hop tree. My property is a Monarch Way Station and pollinator garden. I have host plants for many species of butterflies. The giant is one I have desired for a long time but never had in my garden. My question is will they overwinter in chrysalis in Northwest Georgia? My sun porch will be heated all winter due to my citrus trees I bring inside. Will they emerge due to the warm sun porch or should I take the trees outside with the chrysalis? They caterpillars have gotten pretty big but I must confess that I don’t know how big they will get when they are ready to go into chrysalis. They were very small a couple of weeks ago. I consider myself an expert with Monarchs but am at a loss with the Giant Swallowtail. Monarchs are emerging daily and I am tagging and releasing them after testing for parasites. Will the giants stay on my back porch this winter? 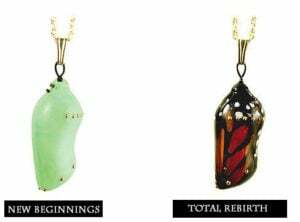 So sad, I had 3 in chrysalis last night and today they are gone. I have one left so I brought the pot inside. Bird? I just found 2 giant swallowtail caterpillars in my orange tree. The tree also has a bad case of woolly mold. 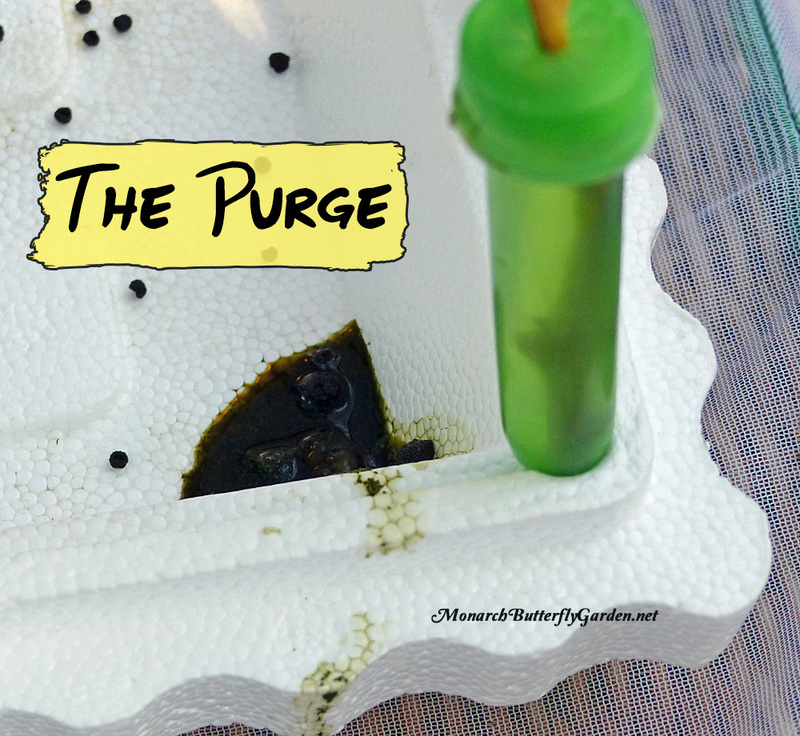 I would like to save the caterpillars while treating the mold. Where do I begin? I just noticed I have at least ten of these caterpillars on my citrus tree I just brought inside recently. They are pooping all over the place, my plant is only 4 ft tall, think they will kill it? I hope you see this and respond quickly, as I have a big dilemma. 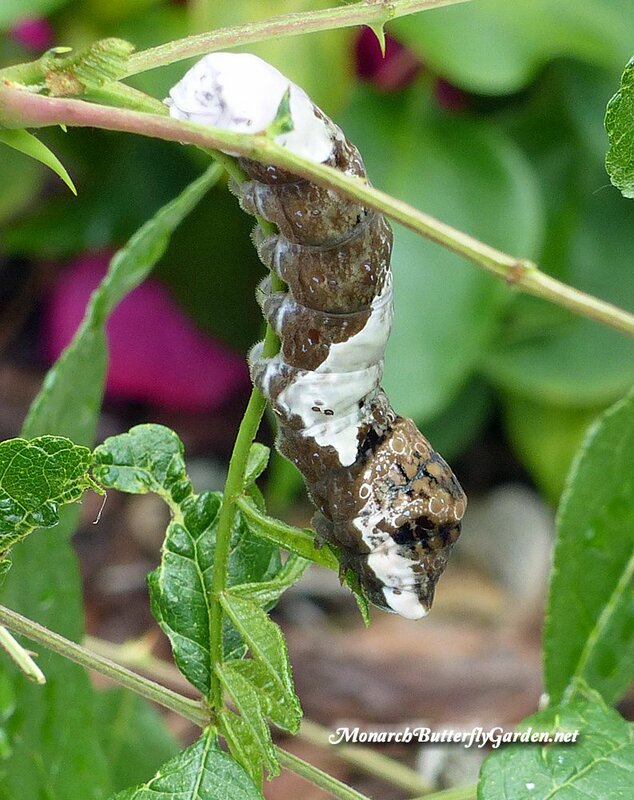 A giant swallowtail laid eggs on a lemon tree, and now there are ten large caterpillars. Problem is, soon that lemon tree will go into a sunroom for the winter, and the owner of the sunroom does not want swallowtail butterflies to take care of. We live in the northeast. We bought rue and planted it outside, and just transferred the caterpillars to the rue plants, along with a bunch of the lemon tree leaves, hoping they would adjust to the rue and make their chrysillis and overwinter on the rue. I just read that they rarely will eat rue after eating citrus, and they will starve. Is that true? What to do now? HELP!! 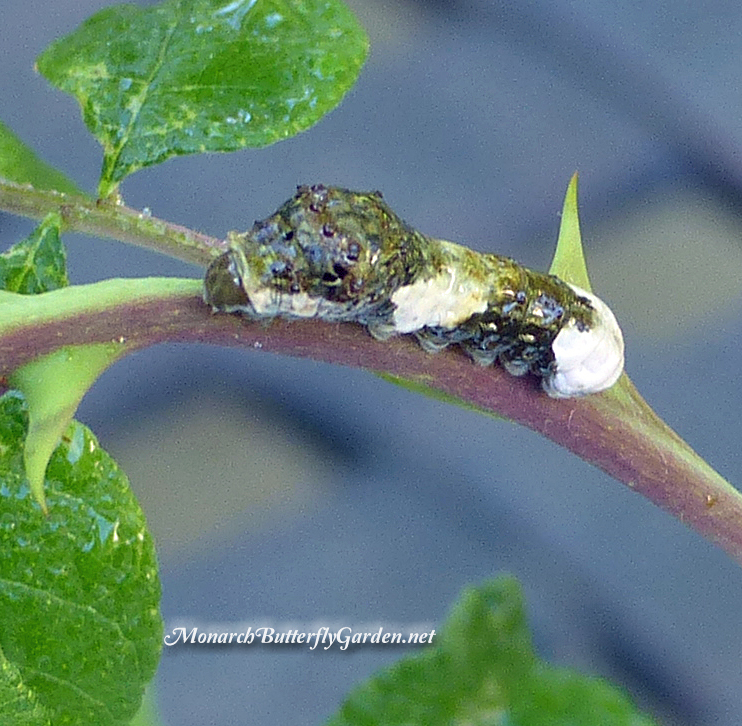 I transferred my giant swallowtails from prickly ash to rue..it took about a day but they eventually started to eat the rue and thrived..2 turned into a chrysalis today right on the rue plant. Now to wait until the spring!! Giant Swallowtail cats unless necessary. Hi Karen, even if you bring in just a few you are making a difference. Predators are part of a successful butterfly garden and you can’t (and shouldn’t) save them all if you want to support a healthy ecosystem. Good luck with your caterpillars! Thanks Tony, Well 4 of 7 survived. The 2 raised on the wild lime leaves wouldn’t eat the rue but the younger ones switched over fine. However, the adults made their chrysalis’ yesterday on the rue, not the branches I added. One already fell. How long until it hardens enough to rehang and would you use contact cement? Just saw your previous answer to this. .Thanks! Hi Karen, I have not had to rehang a swallowtail chrysalis before but have heard that contact cement works. If you use it, please report back with experience…good luck! In my attempt to attract the Monarch Butterfly, of which I have only spotted one this year in my garden, I planted Rue, Fennel, and Dill. Although the numbers are not impressive we were so delighted this year that we have released 13 Black Swallowtails and 5 Giant Swallowtails! We have never seen a Giant before but the majority of the eggs and caterpillars were found on our Rue plant more than the Dill or Fennel. We are fortunate to have a nursery less than a mile away that has everything I need for my butterfly garden. They also allowed a lady to install a screened in butterfly area and we have been able to gain much knowledge from her over the year. Hopefully we will see some Monarchs next year but until then we are having a great time raising the Swallowtails! I was so happy to see you getting into the Swallowtails. I have been raising Monarchs here in Florida but have expanded to Cloudless sulfurs (they love the Cassia plants),Gulf Fritillaries and Zebra longwings (love the passion vine for nectar and host) and Polydamus Swallowtail which loves my Pipevine as a host plant. Have dozens of babies, gave up trying to bring them all in. I enjoy your posts and all the great information you provide. I will say, I am seeing less monarchs this year, but have done my best to contribute to the population! I am hoping to find a source for some northern prickly ash saplings..2 or 3 I would hope. I live in Northern VA. 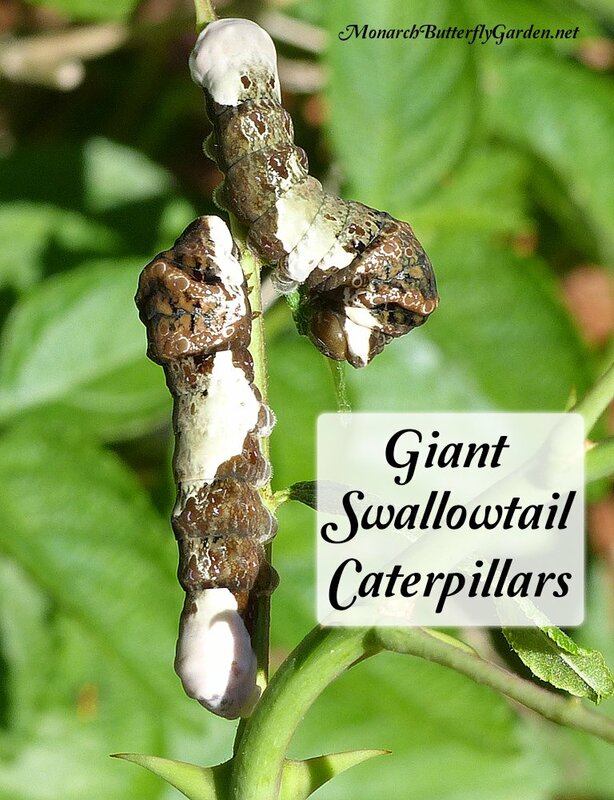 I would like to try to raise a few giant swallowtails. I haven’t seen any nearby but I know that some have been raised in this general area. I have successfully raised some eastern black swallowtails on parsley or dill inside. Last year I had some dill outside (that I was trying to raise for myself) that were decimated by black swallowtail cats. Initially I was angry at the invasion but then I was happy–it didn’t last though–my Carolina wren discovered the bonanza of cats the next week and stripped the dill of cats in one morning to feed her brood. I was angry all over again for losing the cats. (Since I was raising the dill for myself I hadn’t brought in the cats.) Then I decided that I was feeding the birds year round so I had to accept the circle of life. This year I planted parsley and dill for the butterflies but to date no eggs or cats…sigh. I have started a couple good sized milkweed patches in the yard for monarches. I have seen one lone male around them but again no females to date. No eggs or cats either. I just ordered 10 Monarch eggs/cats (no choice which I get). I will be raising them inside. I hope I will get a female or two to lay eggs outside in the patches. I have common, swamp (white and pink), tropical, hairy balls and butterfly weed in my milkweed patches. I hope to tag any male monarchs I raise. I know that few Monarchs from VA make it to Mexico. I want to leave the females untagged in case the small added weight might further reduce their chances to make it south to reproduce next spring. 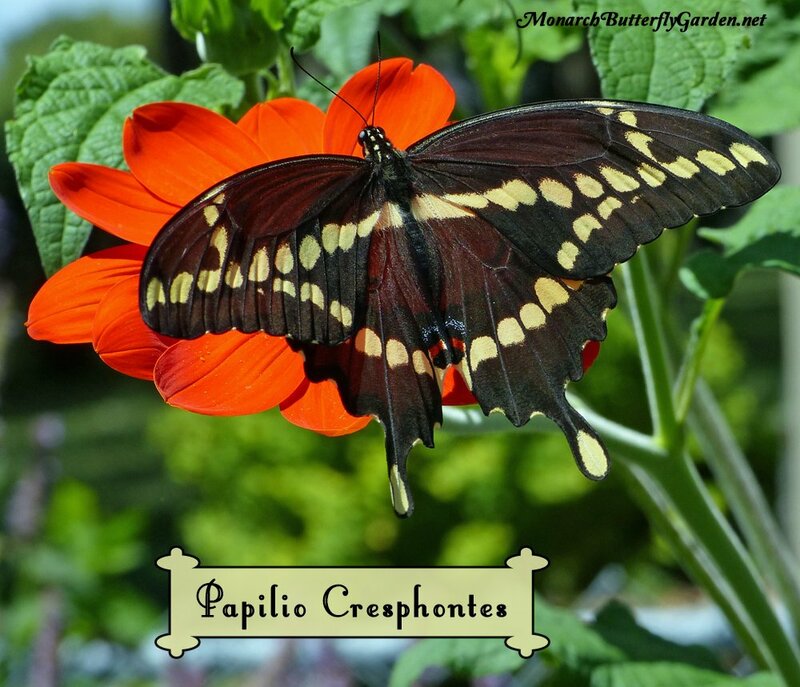 I have a number of other butterfly host plants for other species. I get clouded and unclouded sulfurs, tiger swallowtails, zebra swallowtails, and many other species in my yard. 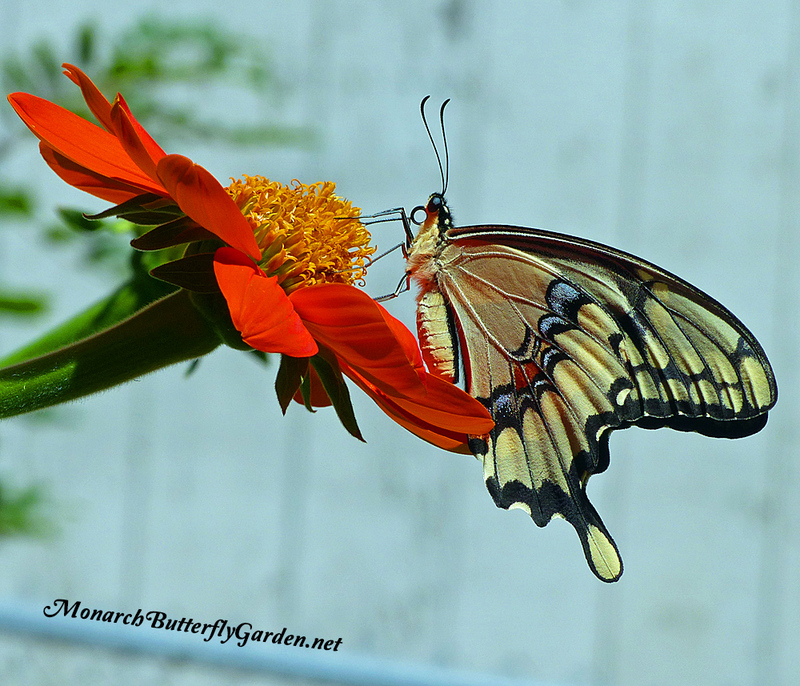 I am trying to add more host plants and nectar plants each year. I would like to see you list some good sites that either list and/or sell good monarch or other butterfly species nectar plants. One of the favorites here is Verbena bonariensis aka Purpletop or Tall Verbena /Vervain. I enjoy reading Tony’s blogs and everyone’s comments. Thank you for taking the time to help us all help butterflies. My update for my GST’s is a good one. So far 7 out of the 9 GST’s I raised have emerged. Yesterday I found a GST caterpillar (probably 3rd instar?) on one of my rue plants! I brought it into one of my rearing cages and will hopefully also be releasing it as a full grown beautiful butterfly. Also last night I found 3 GST eggs on a different rue plant. So I’m excited b/c my goal is to establish a GST population here in OH and it looks like it’s working so far. Thanks for all your updates! I love reading your posts, they’re so informational! great news Roy….I think there tends to be a larger population in your eastern direction so I think you have a good chance of making your garden a regular GST destination in spring/summer. good luck! Hi, Tony, I found four black-swallowtail caterpillars on some of my Fennel plants. I brought in three, because one was missing the next morning. Happy to say I raised two from the third instar stage to adulthood. I had two healthy males. My third one did not make it. I posted videos on my face book site. I was very thrilled, because this was my first time raising them.I am looking forward to part taking in the tagging monarchs during the migration. My milkweed plants are dropping yellow leaves at this time and I am very concern that I my not have enough healthy plants. I currently have two Monarchs in their chrysalis stage, and several caterpillars I am raising in doors. Thanks for all the information. Hi Sharon, congrats on raising your first BSTs! 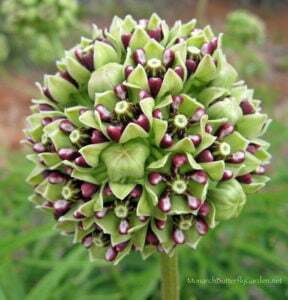 As for milkweed, if you want healthier milkweed later in the season, you can cut back common milkweed after if flowers so healthy new growth can emerge. 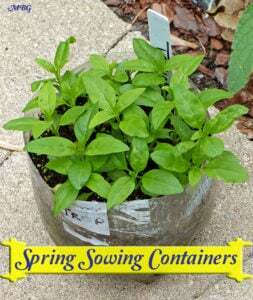 Also, plant some species that stay viable later in the season like swamp milkweed or tropical. Most of our late season eggs are on tropical mw. 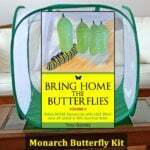 Thanks for sharing Brenda’s Butterfly Habitat link. Her butterfly house next to Barson’s Nursery in Westland MI is a wonder to behold. They carry all the host plants for the different variety of butterflies, a special place for us butterfly people in the S.E. section of Michigan. Her book is excellent also! Barson’s has a great supply of butterfly plants. Brenda’s butterfly habitat is a wonderful place to learn. I am over in Garden City about a mile from Barson’s. I have spent a lot of time over there this year. Thanks Tony, I just never thought anything could eat a chrysalis, especially a giant swallowtail inside the patio. We are going to attempt another enclosure that will be harder to get into. The same critter also eat ten monarch caterpillars the same night. Please help, my Giant Swallowtail chrysalis were taken/eaten, I had five inside my screened patio last night and this morning they are all gone off of their twigs, which were stuck into a plant on top of a table. Anyone have any idea what would eat them? It would have to be small because all five twigs were not moved a lot. If it was a rat the twigs would have been more out of place, the crime scene was too clean. My husband said lizards, can one lizard do this much damage before 7:30am. My heart is broken. Hi Cherri, so sorry to hear this. My guess would be mice or lizards. It sounds like you need an enclosure or “predator proof” the patio. Good luck with your next eggs/caterpillars. Planted rue and fennel and we see swallowtails flying about in the neighborhood but still no eggs. Hoping to find some soon. Hi! I was very excited to witness an anise swallowtail laying eggs on the fennel and dill! I found 4 eggs and brought them in…..only 3 hatched and one didn’t grow well and finally died. 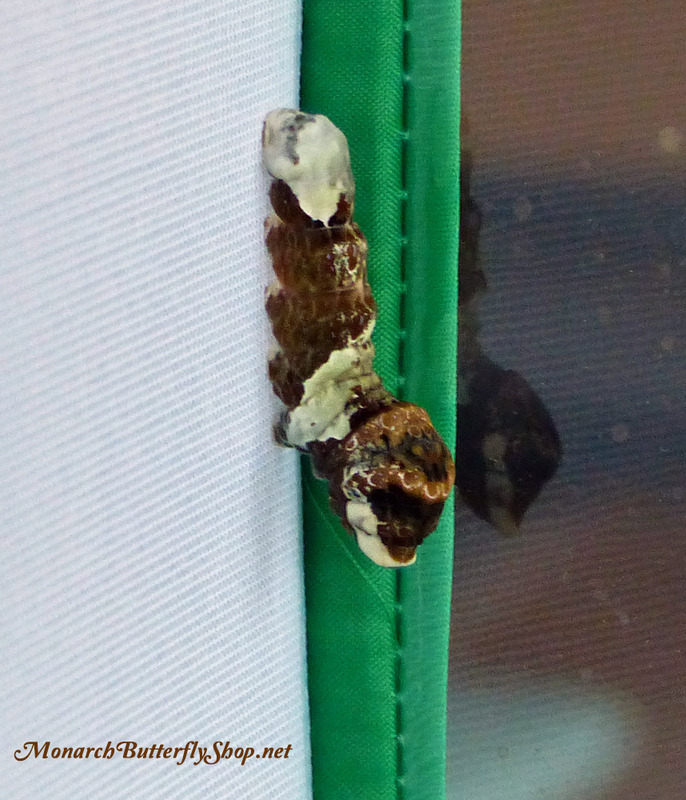 So I ended out with two in chrysalis….but one formed right on the zipper of my enclosure and I must have ripped the bottom thread!!!! Its turning dark, IDK if it will be ok and I’m so bummed over that. They were such cute caterpillars! I also have 4 GST eggs…..got to witness that butterfly laying eggs too, so they were easy to find. 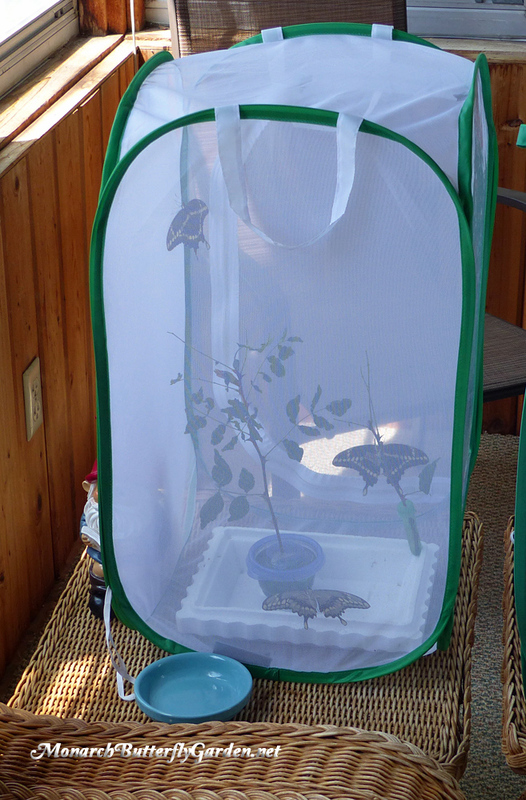 So now I have 1 swallowtail cage and two monarch cages! So fun! Those giant swallowtails are so huge! And I’m still waiting for the gulf fritillaries to find my 3 new passion vine plants! We’ve never released Monarchs in the spring before this year. But this year we were able to find milkweed plants a lot earlier than ever before, here in Tulsa. We planted them early, and although we never saw a Monarch, found 11 caterpillars, found 4 chrysalises, one which was not viable, but raised 3 Monarchs that headed north. We expect to do much better in the fall with the amount of milkweed we have growing. Hi Don, congrats on getting some of the early spring migrators this season. The numbers were small so you were very fortunate to have some stop by your garden. I hope we will be able to send you some more in the next few weeks when the migration begins. I am new to rearing butterflies. I have 6 monarchs in chrysslis now (which I raised from eggs gathered off milkweed). I have about 6 giant swallowtail eggs, waiting to hatch and maybe another 6 cats, my biggest one is about 1.25in long. I’ve noticed though that they don’t seem to be eating much. We built an enclosure and have a hardy orange tree that we dug up and put in with some nectar plants. My question is, how long does it usually take for GST cats to go through all of their instars, we’ve had these guys for 2 weeks and the Monarchs have gone from egg to chrysslis quickly while the GST’s are progressing very slow. I just want to make sure that I’m doing good and not harm. Either way, I’m very excited to let my baby Monarchs go in a few short weeks! Hi Crystal, swallowtails in general go through metamorphosis much slower than monarchs. The Eastern Tiger swallowtails I raised from eggs last season took about two months, but they emerged as healthy butterflies. Good luck with yours! Hi great info and pictures. I found giant swallowtail eggs on my hop tree. Thisis my 3rd year raising different butterflies. .I started with milkweed and Monarchs with some success-trying to find a variety of ways to protect my caterpillars from birds, tachnid fly and other predators. Last year I was able to attract the gulf fritillary with good success with the passion flower vine. Anise swallowtails came to me fennel and parsley plants. no anise swallowtails at ask this year even though I have the fennel and parsley growing. 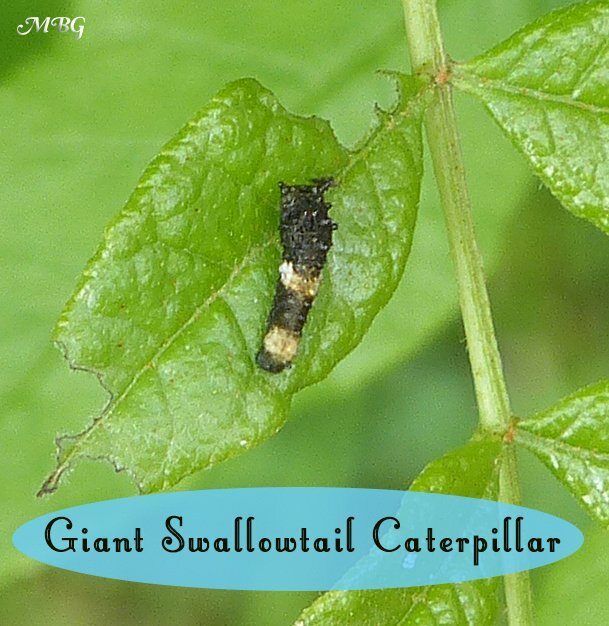 However, I have seen two or three giant swallowtails fly through the yard..even though we have 6 citrus trees, I have never been able to find a caterpillar on any of the trees. we have a couple of popcorn cassia plants so we attract the clouded sulfur. All things considered, it is a joy to sit and watch the variety of beautiful butterflies flying in and it and all around the yard. This is by far, my most enjoyable hobby. A big job in Southern Ca, where we get a couple of months with brutal heat. A few days 100 or higher. We would have to have temp control I expect. Any ideas on the fly house enclosure would be appreciated. .. I live in northern Indiana near Mich. border. I have not seen any Monarchs yet. Have only seen one eastern tiger s.t. , couple of painted ladies, couple of admirals and plenty of cabbage whites. In past years have had several tigers show up. Have had plenty of nectar flowers blooming for some time but no Monarchs. Have lots of swamp mw, common and this year planted tropical mw. Seems like a lot of flowers have bloomed earlier than usual this spring. Hopefully some Monarchs will show up before long. I’ve seen a yellow butterfly looks like a monarch- is it? Or is it a swallowtail? Fluttering in the lime tree’s- we are in Michigan so haven’t seen many butterflies yet. I live in Kodak,Tennessee. I have not seen a monarch this year, and neither has anyone that I have talked to. I wish I had more room to attract the Giant Swallowtail here in Cleveland, Ohio. I do plan on going hiking soon to see if I can find the Northern Prickly Ash and maybe even observe the giants in action. Hi Chris, the prickly ash is like a large bush and you can prune it back to keep it smaller. They also use common rue as a host plant so you don’t need a lot of space to host them…good luck! Is it true that if you have two gst cate rpillars in same enclosure that one will eat the other? Hi Marilyn, it’s never a good idea to place large and small caterpillars together of any species. I never had issues with our gst caterpillars, but two of the eggs were eaten and I should have put them in a different cage. Thank you Tony. I will try to join the Raising butterflies site. I really appreciate all that you share with us. 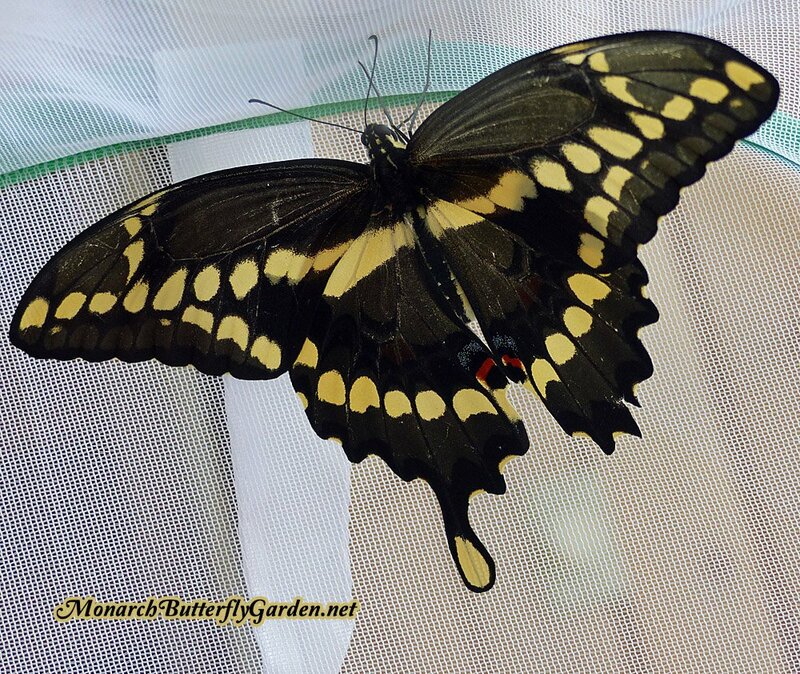 Sadly, I have not seen any Monarchs as of June 26 but I have brought in over a dozen Black Swallowtail Caterpillars and 4 Giant Swallowtail Cats. They now range from and inch to an inch and a half. Quite ugly things. 🙂 This is only our second year raising butterflies but very rewarding since we had never seen a Giant Swallowtail in the wild. congrats on all your swallowtail success Norm. I thought the GST’s were pretty ugly until they reached their final instar…very cool looking caterpillars! Next year, I want to put in host plants for the Giants, along with other butterfly hosts, so this article was of extreme interest. 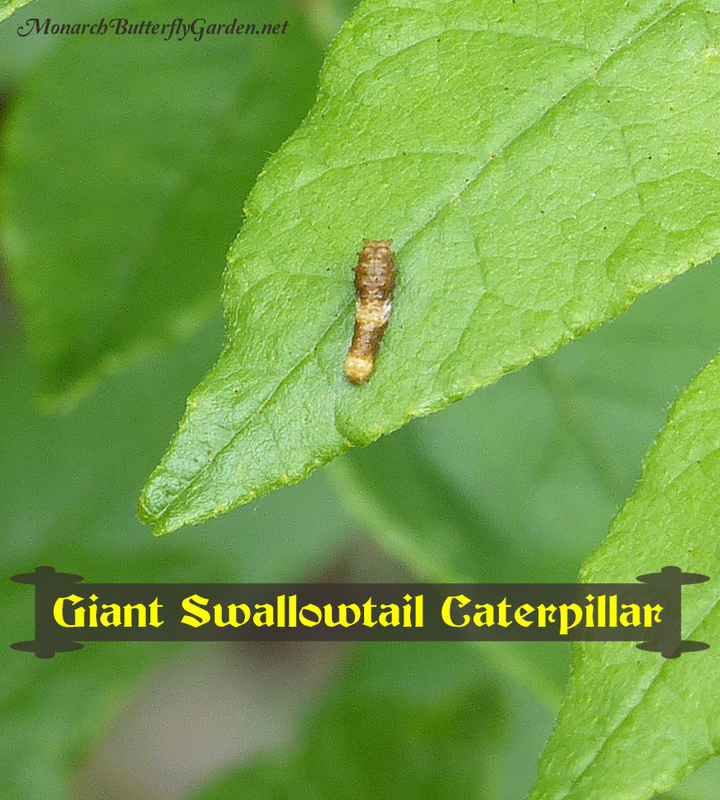 Couple of questions–The nearest wildflower nursery has quart starts of the Prickly Ash, but after talking to them today, have been informed that they are only from 4″ to 12″ in height. How long do you think it will take before these little guys would be big enough to support and sustain GST caterpillar development? While the Prickly Ash are getting their mojo up, how much Rue should be planted to provide a viable host source? Anyone else that drops in, feel free to lend advice. 🙂 Thanks, Tony! Great work! Hi Mitch, the prickly ash is not commonly sold so I’d get some from the local nursery. I’m not sure how fast it will grow from that size, but butterflies often choose smaller plants for eggs so you could get eggs as soon as next season. We have 2 good sized rue plants, which works for us because we don’t raise black swallowtails anymore. I would say 2-4 plants is good…more if you plan on raising BSTs too. Good luck! Last year I found a single GST on a rue plant. I saw GST butterfly lasts fall, but had never seen any here in southwest Ohio before that. This year I bought some GST caterpillars and fed them rue & Gas plant. 8 are in chrysalis and 1 is still eating. Today I bought a 20″ wafer ash and am hoping that art least a couple stick around. I’d love to start a community of GST here in Ohio! I am so excited!! I have a beautiful Swallowtail flitting around my garden so checked to see what their host plants are. Fennel, parsley, rue and dill. While fennell and rue are not easy to find, I was lucky enough to find one straggly fennell plant at our nursery of choice. I brought it home and gave it a bit of water and fertilizer and it popped back to life just in time for my Swallowtail to find it and lay her eggs. I didn’t notice any eggs but one day I was looking at it carefully and noticed little black specks on it. To my delight, they were tiny caterpillars. I put the plant into my Monarch cage and the caterpillars are growing by leaps and bounds. I can’t wait to be able to release Swallowtails, too!! PS I released 21 Monarchs today!! Hi Roxane, those are eastern black swallowtails that feed on on parsley, rue, fennel, etc…congrats on your find and all your monarch releases! Yes, I live in central Florida and my black swallowtails love fennel. Released 159 Monarchs last year. Hoping to do as well (or better) this year.